Take on overflow work from design firms: Contact web design firms to find out if they have overflow work that they might send your way as a subcontractor. Don’t immediately sell. Ask questions, listen, provide suggested solutions to problems. How long should each task take? What content needs to be re-worked for the web? When does content need to be ready? Who will prepare the content? What changes will be made compared to the existing site? Any feedback from user testing? Must meet objectives; supports goals, functional, fast loading, etc. Colors, Typefaces & sizes, graphical elements, textual tone, etc. Graphics sliced & diced from graphical template (mockup) to be coded back together. Build templates to based content pages on. Biggest delay point: is the content ready? Connect Database back-end, server side scripting, CMS, etc. HTML Check: Is code sound, does it validate? If site leverages security, test for security leaks, holes. 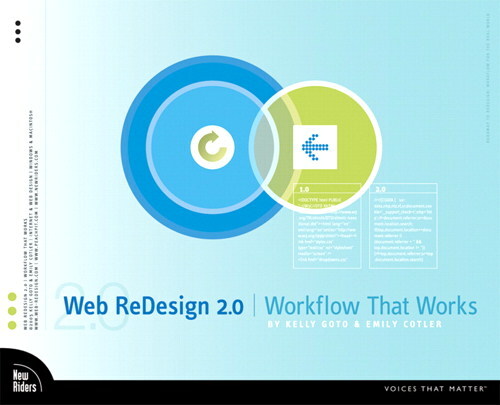 Web ReDesign: Strategies for Success: Course offered from Lynda.com. This entry was posted in Mentorship Series and tagged chicago dreamweaver meetup, dreamweaver meetup, Mentorship Series, web design, web design process, web design workflow. Bookmark the permalink. Dennis, thank you for the great instruction so far. I really appreciate this Mentorship Series–and all the time you’ve put into it.